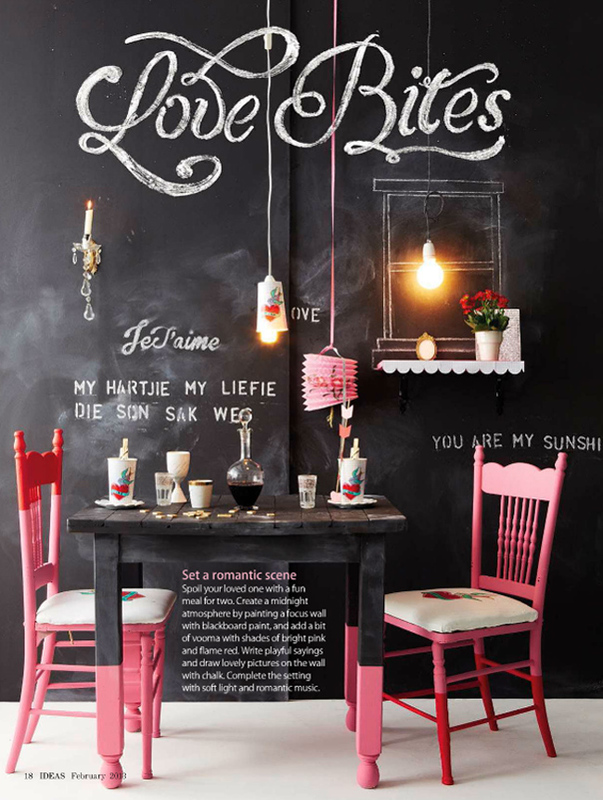 A fun Valentine idea coming from Ideas Magazine out of South Africa that I came across recently (which by the way is fast becoming a fave magazine)! Since Valentines is less than two weeks away, I thought this was fun inspiration for then or anytime. Setting the stage for a romantic meal for two. 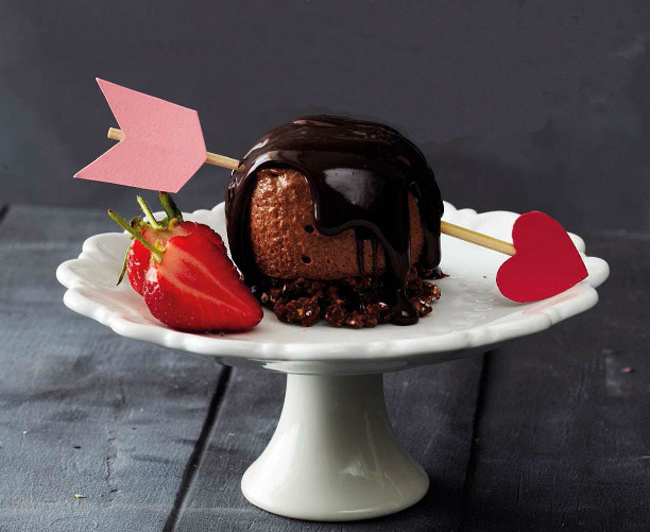 Loving the red and pink painted chairs, the little chalk drawn window with a real shelf, the paper lanterns and yum this chocolate kiss desert (complete with a little arrow made using a thin dowel/or chopstick and paper heart and arrow end using a glue gun)! Fun! I picked up my copy of Ideas Magazine via Zinio. Also how cute is this origami chopstick idea I found on their website. Click here to see how to make it. I was thrilled to read this post about Ideas magazine. Being a South African who now lives in Canada, i realized as soon as I saw the writing on the chalk board wall, that there was an SA component. I had no heard of Zinio before but have now downloaded it o my ipad and and subscribed to a few SA mags, including Ideas! Thank you so much! This is pretty adorable, and I've never been huge into VDay. Love the origami....always love a good bit of that! I am definitely going to have to check out that magazine. I need some new reading material to go through during my little fella's nap time! 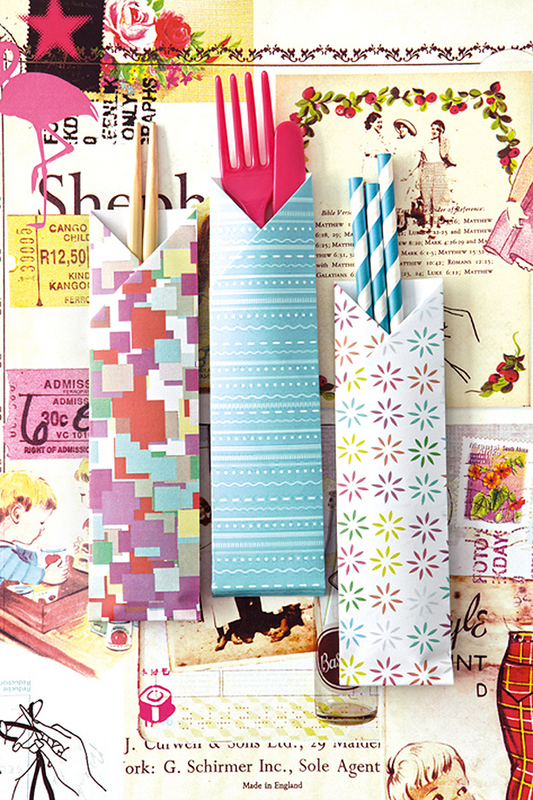 Also love the idea of those origami folders used with paper straws! Super cute! !